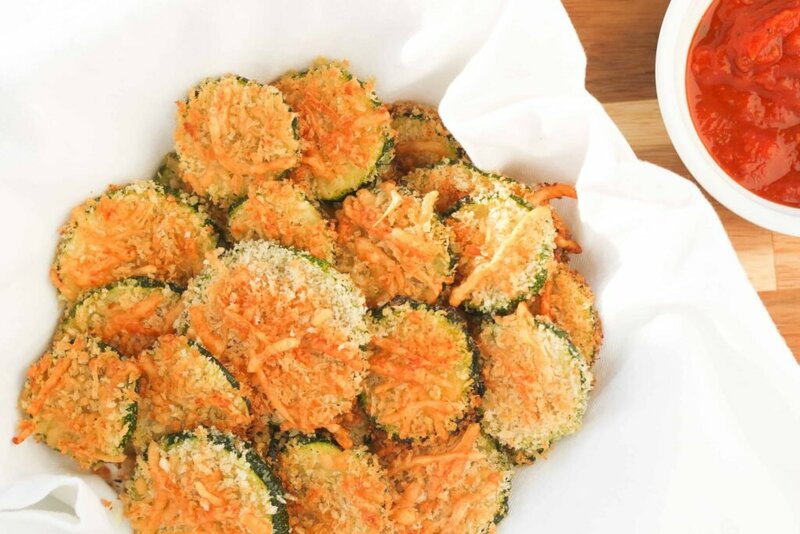 Parmesan zucchini chips make a fabulous healthy and easy snack idea when you want to limit or completely remove unhealthy or processed snacks from your diet. What’s even better is that they taste amazing and even kids will gobble them up too! 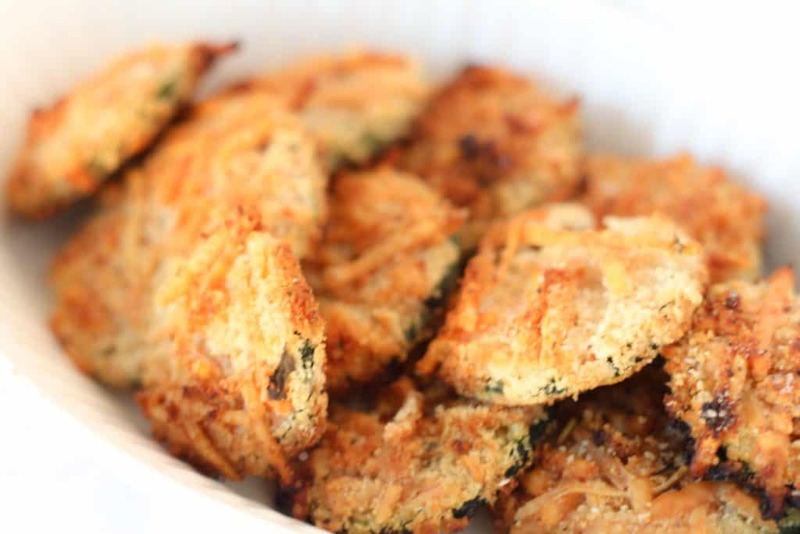 We absolutely love these crispy and crunchy zucchini chips and especially love to make them when we have a ridiculous amount of zucchini in our garden. 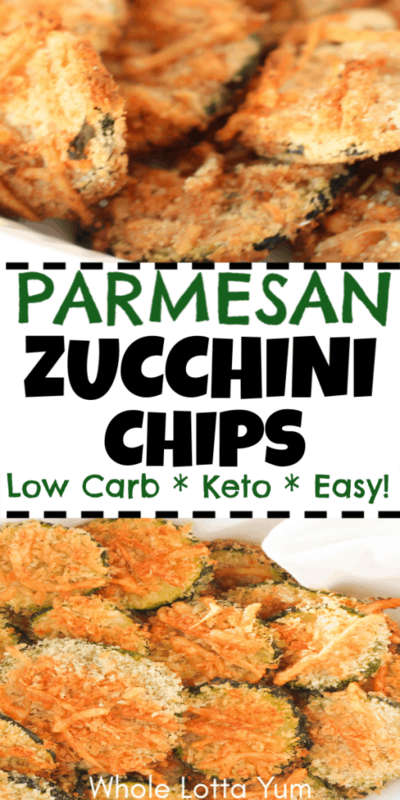 You of course can eat these yummy parmesan zucchini chips anytime during the year by buying zucchini from your favorite grocery store. 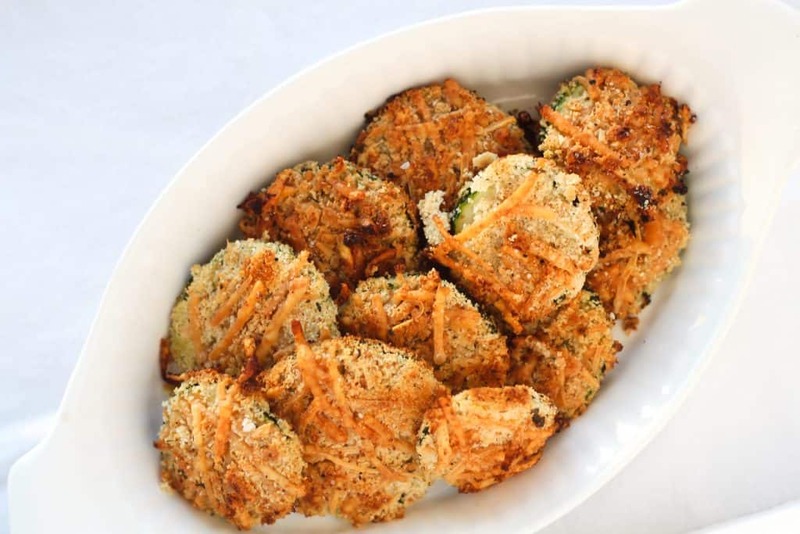 For the recipe we have two variations, one with using panko breadcrumbs if you ‘re fine eating gluten or bread products, and another version for people who want gluten free or keto parmesan zucchini chips. These easy parmesan zucchini chips make a fabulous substitute for potato chips, crackers and other treats. 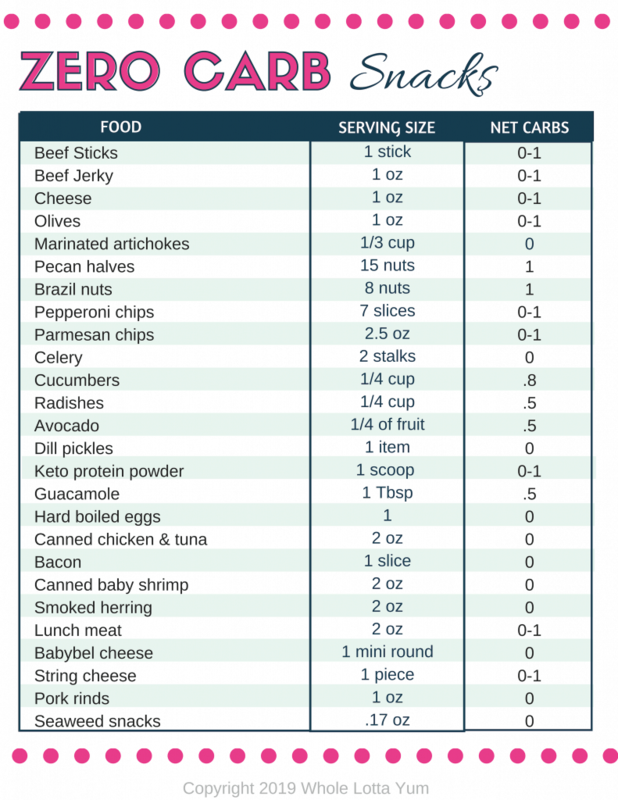 I’m always a fan of making simple food substitutions to avoid having to buy special ingredients at the store, so if you’re out of olive oil, feel free to swap it for canola oil or vegetable oil. If you don’t have garlic salt, use a little less salt and add your favorite spice. Parchment paper – we’ve started covering all of our baking pans with parchment paper for easy clean up. The parchment paper can also be composted instead of getting tossed in the trash. 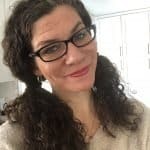 Manodolin slicer – you can definitely just slice the zucchini with your favorite knife, what I love about using a mandolin is that the slices are perfectly even and this works fabulous for making noodles too! Preheat over to 450 and cover a baking sheet with parchment paper. Slice your zucchini to 1/4″ thick slices. Mix the olive oil, salt and pepper in a medium sized bowl, then add the zucchini slices and mix to coat. In another bowl, mix the breadcrumbs and parmesan. NOTE: If you decide to substitute almond flour for the panko breadcrumbs, they’ll still be super tasty but won’t get as crisp. Feel free to add extra cheese since the parmesan does get nice and crispy! 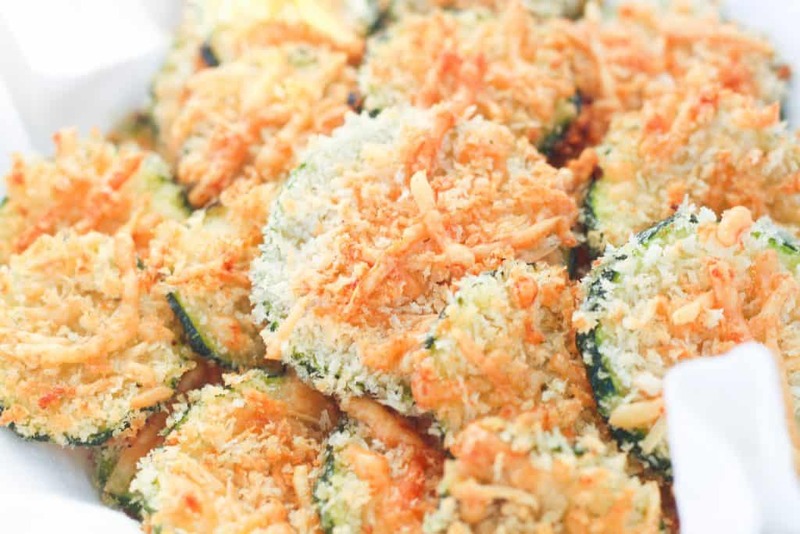 Dip zucchini into the bread crumb and parmesan mixture, pressing to get the cheese to coat. 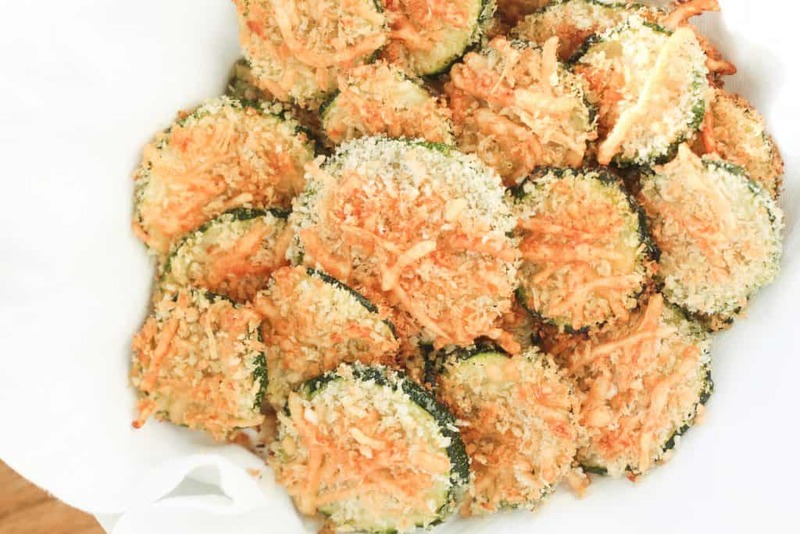 The cheese in particular is what makes these crispy, if your shredded cheese is thick and not sticking well, sprinkle some of it directly on the zucchini. As noted above, definitely add extra cheese if you skip the panko breadcrumbs and use almond flour instead. The cheese gets very crispy! 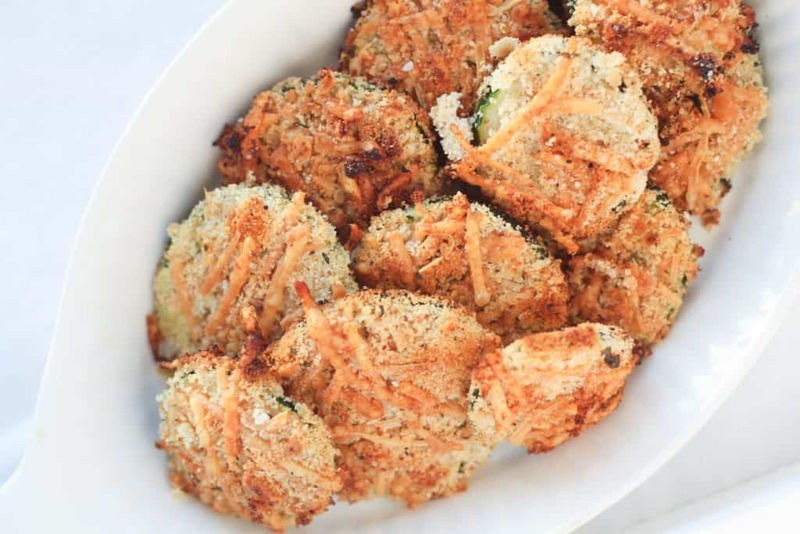 Bake the parmesan zucchini chips for 10 minutes in the center rack of your oven on 450. If they aren’t browning evenly, rotate the pan and continue to bake 10 minutes longer. Optional dips you can use for your zucchini parmesan chips include pizza sauce, ranch dressing, or your favorite marinara.